The strategy consists of written puts. We can write puts to profit from the advance of the underline security price when the implied volatility is high and when the expected price rising is relatively modest. High implied volatility means that the premium we received as sellers of the option is high. If the price of the underline at expiration is above the strike price of the put then it will expire worthless and we will have a profit equal to the premium we received. In case that we expect a strong upward move in the underline then it would be better if we bought calls, because they have an unlimited profit potential, whereas written puts maximum profit is limited to the premium we have received. The short put strategy is also used as a means of buying a stock at a lower price if the puts expire ITM and hence exercised against the writer. In that case he/she is obliged to buy the stock at the strike price. 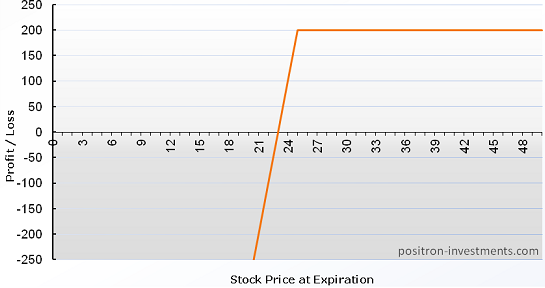 Maximum loss: Very high (until the stock goes to zero) – premium received + commissions. Maximum gain: Limited to the premium received – commissions. Below we can see the profit/loss diagram for a short put with strike price $25 and premium $2/share. 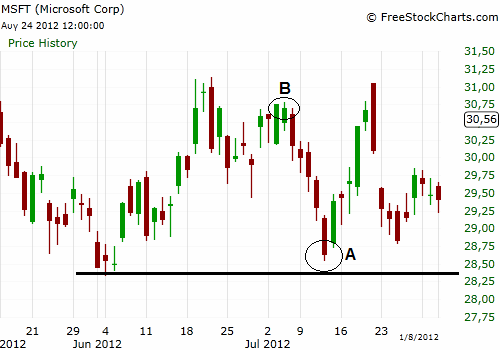 Below we can see the daily chart of MSFT stock. We have spotted a support a little above $28 and we can see that at point A the price revisits this support for the first time. Suppose also that the market (SPY) is in uptrend and this last case augments the possibility of a reversal. The fact that the price declined rapidly from point B to point A denotes that implied volatility is high and hence the price of the options are also high. If we expect a modest price advance from point A for the next month, we can write put options with strike price $28 and expiration one month from now.